The first, most distinguishable relationship to the landscape castles have is that they stand out. Rarely will you see a castle that is nested from site in a surrounding forest. 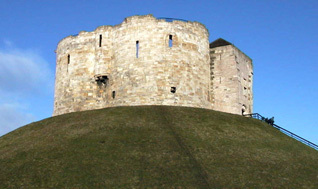 As a general rule, castles are built out in the open for all to see. They do not blend into the landscape, they tower over it. This achieves a look of power and command, which coincides with the feudal system of land ownership that was prevalent in the middle ages. At this time, the lord of any manor had to make it known that the land was his and that no one was going to take it away. From a defensive perspective, being out in the open made advancing enemies visible from very far away, allowing time for the residents of the lord's land to retreat to the castle's protection. 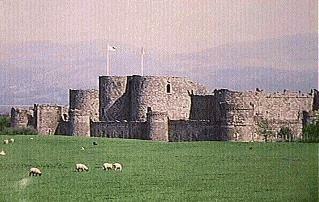 It was also quite common for a castle to be situated on a hill. 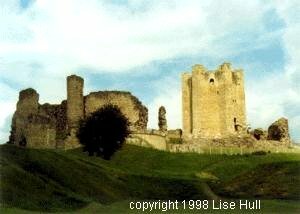 Like standing out in the open, the elevated position of hilltop castles contributed to their commanding, mighty nature. It also provided a defensive advantage in that (a) it was more difficult, if at all possible to use siege engines against the castle. And (b) attack was difficult for forces advancing up a slope thus giving the defense the advantage. 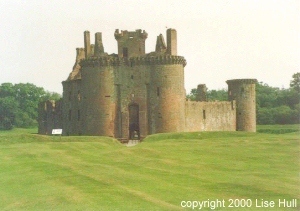 Many castles were built up against a body of water or had trench called a moat dug around the perimeter base (which was then usually filled with water). For obvious reasons, this was a very effective defensive aspect as advancing forces could not get directly to the wall without first swimming to it. 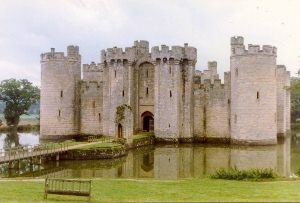 If a besieging army was to use a battering ram against the gatehouse door, that portion of the moat had to be first filled with barrels over which it could roll.